In the release: nightly builds of 3rd version, a new SEO Tab, a big update of Vasily Naumkin’s components, user references on modx.pro and some details about refactoring from Jason. The MODX podcast was released a week later due to technical issues, although there are plans to release both a digest and a podcast in one day. Nevertheless, many moments have since been refined, permits obtained from services for podcasts and so on. The podcast site has been updated, now everything is beautiful and working — https://modcast.by. The podcast is added to iTunes, Overcast, PocketCast, Yandex.Music, subscribe and listen to where you prefer. About two weeks ago, the guys from Sterc asked me to build a working build of version 3, since almost a year has passed since the last release of the alpha version, and quite a bit of work has been done during this time. I tried to create build but it didn’t work out the first time, I started to figure it out, and then I decided to do not it all by hands if it can be automated and I made a nightly build service where builds happen at every night — https://nightly.modx.by. There are plans to add language downloads directly from Crowdin, since translations are usually added before the release, and in the git-version, the actual texts are only in English. And it is likely to check if there were changes in the repository and not to build without the need (also need to save space on the server). Since code freeze was announced and Jason said that he still does something, the activity in the repository for these two weeks has dropped. This is also due to the fact that many people are preparing in a meetup in Amsterdam, because you need to decide work and household chores, and for someone else to prepare slides and talk. However, what did they do? 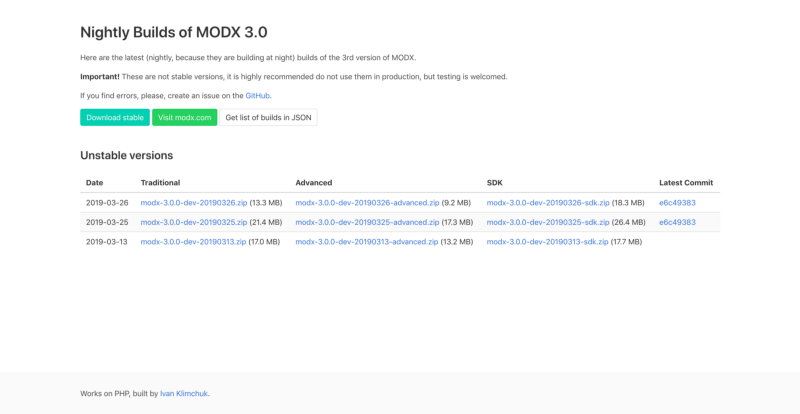 MODX 3 now requires the minimum installed version of PHP — 7.0. Yes, many people may wonder why not something fresher, because 7.0 is no longer supported. The answer is simple, there are statistics (albeit not comprehensive), which says that about 40% of users still use version 7.0, therefore, it is unwise to deprive such a number of users of the possibility of updating without a good reason. During of work on the nightly builds service of MODX 3 I had to fix a little build script so now it does what it should. In particular, the old script could not establish dependencies through Composer, now it can. Mikhail Voevodsky made a good attempt to make everyone well by adding the system code, file, inline bindings directly to the core, so you can write code more efficiently, as is now possible in components compatible with pdoTools. However, there are questions in terms of security and the likelihood that this pull request will be accepted still unclear. I did not include smaller fixes, they can always be found on GitHub. In addition to the code, work continues on a new documentation site. Last week I managed to talk a bit with Jason and I was pleased with the good news. There is progress in the work, the main part has already been completed, before the weekend last week, he began converting processors. After he will finish with them, he promised to show the draft on GitHub. Now all classes are loaded via PSR-4, which means that no more require_once and loadClass, now it is enough to connect one autoload.php and use any system classes. Models can now be generated and probably work on xPDO 3.0, there will also be no more string references to classes: we used to write ‘modResource’, now it’s worth writing modResource::class. This will improve not only the readability of the code but will also enable the IDE to more correctly analyze the code and give hints. This is all so far in words since there is no code yet, but let’s hope that at least there will be a result right after the meetup. The mention of users — Vasily Naumkin on the community site added the ability to mention users through the “@”. And it works both in notes and in comments. It may be convenient if you need to attract a person to some thread in which he does not participate and therefore does not follow it. Cleaning community users — while mentions were made, it turned out that in the database with users there was a mess that prevented normal use of the function, so some of the users were dropped, inactive were removed, and the rest logins were “combed” so as not to fail. [jwtSession] Session transfer to browser cookies — An example of using JWT tokens in conjunction with MODX. As an experiment and a solution to a separate task, the tool is very interesting, but it is unlikely that it will find widespread practical application. However, it is worth reading. Defending the MODX Revolution — albeit not fresh, but a still relevant note on how to take care of security and protection from hacking the site on MODX. Good video tutorials about MODX by Coddes. And they have a pretty site. Theme.Bootstrap 3.0.0-pl — updated the starter package with the layout Bootstrap to version 4 of the CSS framework. The update also affected other add-ons (pdoTools, miniShop2, mSearch2, and Office), which use it as a dependency, so before updating, read more about the changes in the article — https://modx.pro/components/17790. SEO Tab 2.2.0-pl is a great update to the SEO component. Something radical was not added but fixed about 10 bugs and five minor improvements. Jevix 1.3.1-pl — an update of typographer for MODX. A couple of little things and inner changes. Article with details — https://modx.pro/components/17827. mSearch2 1.13.1-pl — the main update is the correct accounting of prices after the application of various plugins that change the price of the goods (usually various discounts). Now filters are able to correctly take into account such changes and show the actual numbers in the sliders and other places. More in the article — https://modx.pro/news/17738. SeoFilter 1.6.4-beta — added support for ajax pagination in mFilter2, now compatible with MODX 3. ResVideoGallery 2.0.0-beta — big upgrade to version 2. A bunch of events has been added, now it can work with Fenom and can display photos from the miniShop2 gallery. cityFields 1.2.2-pl — new bootstrap chunks, the ability to change the city through a get-request and many other useful fixes and improvements. logRotation 1.0.0-beta — allows you to reduce the size of the log with errors by removing old records from the log when the specified file size is exceeded. Discussion and suggestions for improving the component in a post on the community site — https://modx.pro/components/17837. Context Export 1.0.0-pl a component from Sterc that allows you to export the whole context in XML format. It can also export access rights and media elements (i.e. pictures and files). Point of Interest 1.0.0-pl another component from Sterc, which allows you to display the points specified in MODX on the Google map. This may be resources or some other component records, or any other data. Documentation is still lame. P.S. Links to paid components are cut from the digest in order not to violate the rules of the sites where the digest is published.